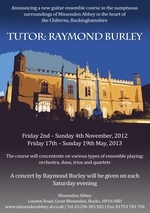 The weekend of 23rd – 25th March saw the last guitar course at Urchfont Manor. As usual it was a very enjoyable session even though it was tinged with sadness. I’ve been running courses at Urchfont for a good number of years never imagining it would all come to an end rather suddenly. 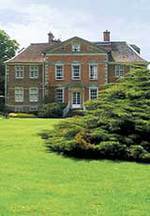 Wiltshire Council is selling the property very soon although, as yet, a buyer is still to be found. This time the chosen large group pieces were Mark Houghton’s Passacaglia and Tango, Arne Brattland’s arrangement of a Praeludium by Shostakovich and my arrangement of Vivaldi’s Concerto RV522, originally for two violins. As always, there were smaller ensembles being rehearsed and performed alongside these bigger pieces. All these items were featured in the student concert before lunch on the last day. The Saturday evening concert featured guitar trios this time, played by Arne Brattland, his wife Debbie Adamson and me. The short programme comprised four pieces by Albéniz: Sous le Palmier, Zambra Granadina, Mallorca and Orientale, a quirky Rondo Amoroso by Norwegian composer Harald Saeverud, Kaleidoscope by Miklos Rozsa and a short Sonata by Poulenc; I blew the dust off my requinto for the Poulenc and Rozsa. The encore was Schumann’s beautiful Traemerei. This time we had two new faces on the course together the many of the regular participants. I’d like to give a huge thank you to all the players and particularly those that have attended for many years. Your contribution is always hugely valued and attendance never taken for granted. Although this was the final Urchfont, I hope we can meet again at a different venue before too long.